does carbon know what nationality it is? let's be quite plain about this - we're testing the whole bike here, not just the colnago frame. this makes perfect sense because, if after reading this review you break open the piggy bank and rush off to your nearest colnago dealer intent on acquiring one for yourself, it's a whole bike that you'll get. 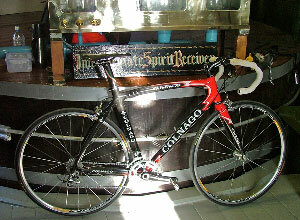 although the colnago clx was announced as being either frame or bike, for 2007 at least, the clx is only available in the uk in the latter format and definitely not as the former. depending on your component preferences, you may find this a crying shame (or not, as the case may be). and, as some folks have asked "how does it compare to a c40/50? ", onward to the bicycle. colnago uk (importers windwave) sent up a 54cm red colnago clx for this test after i'd expressed a healthy interest in finding out how colnago's first carbon offering from taiwan, compared with the more snob appeal italian carbon. i doubt very much whether carbon fibre actually knows what nationality it is anyway, but the molds for the clx's monococque construction are made by colnago in italy for layup in taiwan. and apparently the dropouts are also manufactured at cambiago. let's not kid ourselves, this is entirely down to economics. up till now, the c40/c50, cristallo et al have benefitted from carbon tubes or monocoque from atr, italian carbon specialists and suppliers to ferrari and porsche amongst others. perhaps unsurprisingly, this costs money. if we put this in perspective, the clx on test, kitted out with shimano's ultegra bits costs only £200 more than a c50 frame. if you'd like to join the carbon colnago set, it suddenly became a whole lot cheaper. but is it worth it, and will you like it? the clx frame is immaculately finished (and available in blue or plain (?) carbon fibre, as well as the red one tested), though the carbon weave loses just a bit of its regimented pattern on the top tube join near the seat tube, a small cosmetic flaw.. the top and down tubes sport large external reinforcing ribs -structural, but which look rather cool and business-like. the bottom bracket area is as stiff as they come - massively oversized, yet sculpturally integrated and the down tube makes the tubes on my c40 seem positively mean. the chainstays are colnago's more recent leaf design looking as if they may just have managed to combine the resilience of the hp stays, but with more style. and unlike the conventionally angled stays on the c40/50, these follow the sculptural style of the rest of the frame, curving in from the rear dropouts to the bottom bracket area and managing to morph from round to vertically thin in the process. a neat touch is the threading of the front mech cable through a small hole in a very substantial area of carbon behind the seat-tube. not sure how easy this would be to replace though. islay is a bit agricultural at the moment, so while sploshing the frame with a soapy sponge after a couple of long test rides, finding a replaceable rear dropout was a bit of a surprise. 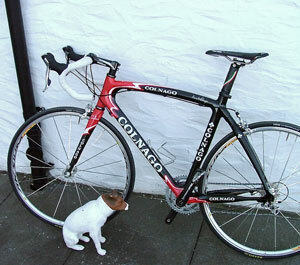 my c40 has no such animal, and i thought it a colnago trait like the external headset. 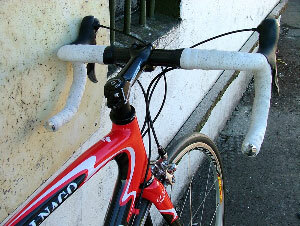 according to windwave, however, replaceable dropouts now feature on all the 2007 carbon frames. 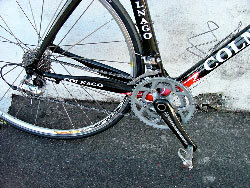 in which case, when you buy your clx, buy a spare dropout at the same time. you just never know. the seatstays arc rearwards in a convex curve, similarly to the cristallo and dream hx. and very stylishly in my opinion. not being a bicycle designer, i have no idea how much of this is structural and how much aesthetic, (probably a bit of both)particularly when litespeed, cannondale and merckx (to name a few) curve their stays in a concave style. if it is just an aesthetic, i heartily approve. 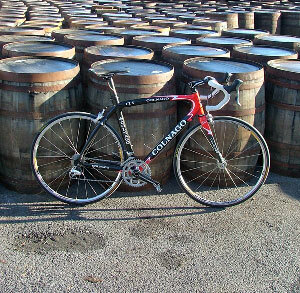 there have been assertions that the clx is colnago's nod towards the cyclosportive market. if we accept this as being the case, it might help explain the very long 150mm head tube. by comparison, the head tube on the company c40 is a mere 125mm for the same frame size. gratifyingly, ernesto has refused to cave in to the integrated headset trend currently afflicting almost the whole of the bike trade. i, along with others, have long asked why it apparently makes sense to move the bottom bracket bearings outboard in the name of stiffness, while shifting the headset bearings in the opposite direction. chris king would concur. the clx forks are carbon fibre top to bottom including the steerer, with external reinforcing ribs on the outside of the fork legs. the headset cap exerts its downward pressure on the stem and headset by threading into a machined alloy insert at the top of the steerer - a more elegant solution than the expander plug i have in the c40. very disappointingly, the polished alloy dropouts boast the so-called 'lawyer's lips' - small extrusions that prevent the front wheel dropping out unintentionally should the rider neglect to tighten the quick release. sadly this renders the quick release anything but, and really isn't a feature you'd expect to find on a bike in this price range. money is no indicator of intellect, but there's a good chance that if you have had enough savvy to choose a clx in the first place, you already know how a quick release works. you can bet petacchi doesn't have these on his fork. colnago has had a long history of finding seemingly more obscure places to 'conceal' the frame serial number - on my c40 it is on the base of the seat tube behind the front mech braze on. my superissimo has it stamped into the right rear dropout. on the clx it is stamped into an oval plate rivetted to the underside of the down tube, near the bottom bracket junction. an elegant solution but i'd be interested to see how the plate fares after being sprayed with several winters' worth of cr@p. the seat tube is tear drop/airfoil shaped in cross section, with a 'cutout' in the lower half to allow rear wheel clearance. 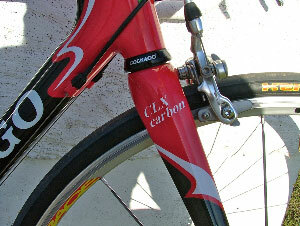 the seatpost is correspondingly shaped but lacking the clearcoat of the clx frame. adjustment of the saddle is via an allen bolt at the rear and a knurled nut towards the front, allowing the angle to be set to very close tolerances, should you feel the need. as you can hopefully see from the photos, the overall look is pretty cool. strangely, the colnago manual depicts the clx with a seat collar sporting two bolts. the test model arrived with a collar with only one bolt. did it make a difference? see the road test below. and tell us please, what bits were attached to make it go? the colnago clx is available in three flavours: shimano 105 (£2199.95), ultegra (£2699.95) and dura ace (£3499.95). 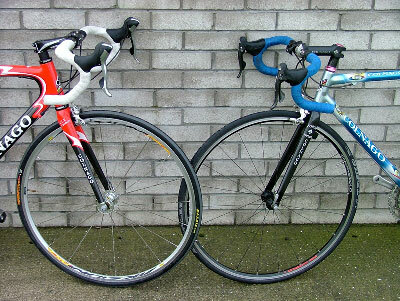 i'm not too sure why the clx is only available in three flavours of shimano and no campagnolo at all, but for 2007 at least, that's what we're stuck with - there will be no bare frame this year on which to hang vicenza's finest. front and rear gear mechs, front and rear calipers and sti levers are all from the big 's' catalogue, while the carbon 'team issue' compact chainset with integrated bottom bracket is from fsa (who live only a few miles from colnago's cambiago home). interestingly this is one area where the far east model differs from its italian brethren. the bottom bracket features english threading and not the more common italian. 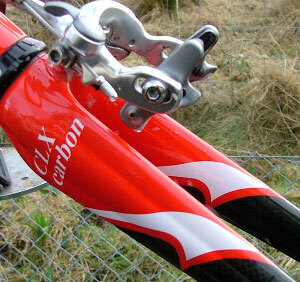 fsa also supply the 'carbon pro' branded, carbon wrapped alloy bars and stem. (these two articles of flight control are not available as aftermarket items). the bars are of the 'flat top and fenders' style, handsomely covered by colnago embossed white cork ribbon. 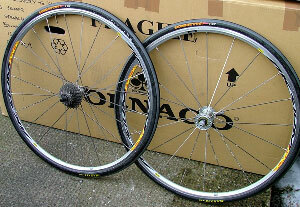 headset is a colnago 1 1/8" cartridge model. the saddle on the test bike was a colnago branded selle san marco, but all production models will sell with a prologo model, in keeping with colnago's recently announced alliance. if there was tutting in the back corner when ernesto decided to have bikes built in taiwan, we should probably direct scowling towards mavic. the aksium race wheels bear small stickers proclaiming their construction to have been carried out in china. cosmetically, they look similar to their big brothers in the ksyrium range: flat blade spokes front and rear. 20 regular bend built radially up front and 24 straight pull built two cross at the back. the rear hub is is a cnc machined chunk with very hefty looking flanges to keep the spokes in check. the wheels were shod with grey and black maxxis hors categorie 23mm tyres, bearing an uncannily smooth resemblance to michelin's pro race model. just on a trivial note, you really have to wonder at the philosophy developing within the bicycle industry - as more and more components and tubes become more and more oversized, it seems that the bits that fasten them in place are heading in the opposite direction. for example, the seat bolt on my three year old c40hp accepts a 5mm allen key, while the clx features the 4mm equivalent. is this to protect us from overtightening carbon bits, or are we just being fashionable? who can tell? the clx and i took a trip out to ardbeg distillery on a crisp, cold, frosty wednesday morning for a coffee and some clootie dumpling. having only opened the rather splendidly colnago emblazoned box on arrival the day before, the fact that the seatpost slipped slowly into the seat-tube en route wasn't really too much of a worry. the seat collar stated 'max 6nm' but being bereft of a torque wrench, i had absolutely no idea what sort of leverage was required, so erred on the side of not breaking anything. the top of the seat tube is slotted front and rear which may, or may not, make it harder to tighten. since the post slipped all the way to ardbeg (about 25km) i thought we had a problem, but it turned out to be pilot error - not enough welly on the allen key. the seatpost has not budged a millimetre since. 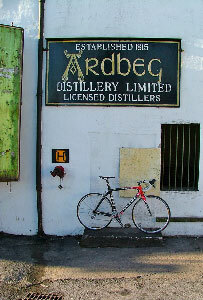 unfortunately, this meant that the round trip to ardbeg garnered some nice photos but not the desired quality kilometreage. ernesto, i apologise for doubting you. (it could also be that shipping versions will have the double bolt seat collar, described above, in which case, no worries. piling on the kilometres in training for this year's london paris, meant that the colnago and i spent a lot of time together over a weekend, unfortunately in sub zero wind chill and a gale force eight wind. since the training route covers pretty much everything - uphill, downhill, smooth roads, crap roads and everything in between, it's probably just the ideal hardship to give a new bike a fright. the wind on saturday's outward stretch kept blowing us towards the middle of the road, resulting in a very acute angle from vertical for about 14km. the clx stability was of great comfort and allied with uncannily predictable handling, the only struggle was pedalling in a forward direction. probably due to its monocoque main triangle the clx makes a wonderful carbon fibre noise. with an all up weight of around 8kg and a rider of just over 65kg the stability in such a forceful wind (quite common over here) was very welcome. maybe ernesto was really onto something when he put slots in the chainstays of the c40hp and c50 strada, because the company c40 feels a tad more supple at the rear than the clx with its leaf stays, however, subsequent whizzes around the principality started to point an accusing finger at the mavic aksiums as the source of this relative stiffness. unfortunately, since the clx is a shimano beast, it wasn't possible to swap wheels to find out (all washingmachinepost kit is campagnolo). since we are testing the whole bike, it seems fair to comment on its 'bits' even if we are dealing with ingrained prejudice in some of those comments. the fsa compact chainset bearing 50/34 rings, makes far better use of a 12/25 cassette than does my own 53/39. but it would make even better use of an 11/23 cassette and i still find myself wondering why it's not the latter that is fitted as standard. easily changed, i suppose. the chainset was impressive - changes between rings were darn near faultless, despite initial incompetent faffing by the pilot. stand up to sprint (yes i can pretend with the best of them) or wallop it uphill and the carbon crank arms were smoothly wonderful. i want no laughing when i tell you that this is the first bike i have ever ridden fitted with shimano gears. changes at the rear were almost unnoticeable - in fact, i quite often wondered if a change had been made at all. this is not a criticism, just an observation, but i have long wondered why shimano found it necessary to index the front gear change. changes are just as slick as at the rear, but it's well nigh impossible to trim the front mech when the chain starts to rub. annoyed the heck out of me. however, i didn't actually like the sti levers. they worked almost faultlessly but i prefer the shape of campag's ergopower equivalent, not just from a visual point of view but from the comfort angle too. and i feel really sorry for shimano users - the rattling of those gear cables drives me nuts. the gears were/are excellent, and i can't quite see how shimano could improve on this with the dura-ace version. respect. my c40 sports a negative rise 130mm stem on a 125mm headtube, while the clx has a very nice 120mm fsa carbon wrapped stem that points ever so gently upwards. consequently, throughout all my hard won kilometres i felt a bit more upright than i wanted to be. if we believe that the clx is colnago's entry into the cyclosportive arena, then not only does his 'heads up' approach make sense, but so then does the compact chainset. while i do prefer the more heads down, stretched out position, by the time the test was over, the positioning on the clx was beginning to find more than just a modicum of favour. the bars managed to confound and comfort. the top is almost flat giving an incredibly comfortable handgrip position. i'm not really a 'top of the bars' kind of guy, but bars such as these converted me in only about two rides. maintaining this degree of comfort even when the top had to be angled slightly downward in order to have the same comfort when on the hoods. however, call me a luddite if you wish but i just cannot get on with anatomic bends on the drops. my own itm bars have the traditional curve with a shallow drop, allowing me to climb hills while on the drops. (i will readily admit that this entirely down to personal preference) if i bought a clx, i might think about changing the bars and stem (for length) to others from the fsa range. so while we were almost talking about climbing, this is something at which the clx excels. allowing for all statements being relative, i can generally climb hills far better than i can manage flat and bumpy, and i like doing the former while standing up (i know, it's supposed to be more efficient while seated, but that's my problem). the clx just goes forward and upwards the minute you stand up on the pedals and give it some welly. there is no hint of any squidging in the area of the bottom bracket, and it was the lack of any lateral movement in the rear wheel while climbing hard that has pointed that out as the possible source of seated rigidity (in comparison to the c40, it has to be said). climbing is a real joy and is unbelievably smooth. when it comes to going down the other side, the clx follows the legendary trait of its big brothers, and manoeuvres as if on rails. to put it bluntly, where you point it, at whatever speed, that's where it goes. it's just as incredible as it sounds. however, if you have to stop doing that in a hurry, there's good news and there's bad news. while out getting both bike and rider very wet, a concerted effort to slow down for a right hand turn failed to produce the expected result. this may have been due to relatively new brake shoes on relatively new alloy rims covered in rain and agricultural crap, but it's not quite what i'd hoped for. bizarrely, a couple of days later, when braking ever so gently for yet another right hand turn, the rear wheel momentarily locked up. now much as i am conscious of continually comparing italian and japanese componentry, i have failed to replicate either scenario with either veloce or chorus calipers, over the past ten or so years. i have had the luxury of owning and riding a colnago c40 for the last three and a half years, probably one of the finest colnagos ever to come out of cambiago. the clx doesn't come from cambiago, and while that might upset the purists, they're the ones who will lose out. 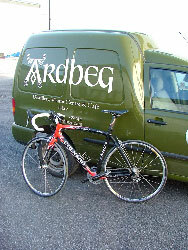 i managed nearly 500km on the clx in the couple of weeks it was on holiday on islay, and i absolutely loved it. it's a colnago through and through - if you chopped it in half it would have the clover leaf all the way through the middle. personally, i'd prefer a frame option, because i like to fit my own choice of bits, but i did have a long think about it.